From there the situation devolved rapidly and I was left with a whiny toddler demanding that I make cookies that he wouldn’t have to share with anyone. It wasn’t the kind and helpful afternoon that I had imagined. Looking back at him, I realized I needed to give the poor kid a break. I mean, he’s 2. He IS kind, and he WOULD have shared his cookies, and I knew that. I took a step back, thought about it, and changed gears. I reran the day in my mind and remembered the kind and helpful things my toddler actually did. He told me my hair looked nice (it didn’t), and he meant it. He spontaneously kissed his brother’s head about 14 times (that I saw) today. There’s more, but the details aren’t as important as the lesson I learned. I have to meet my son where he is, and he’s just not developmentally in a place to set selfish desires aside without help and practice. He’s a sweet, kind, smart boy with (usually) helpful intentions. He does his share of naughty things, but he’s also pretty great most of the time, even when he doesn’t think anyone is watching. My boy found joy in service today, loading the onions into the refrigerator door. He found joy in service praying for his dad’s migraine to feel better, and singing to comfort his tired baby brother. They were just small acts, but I’m okay with that. 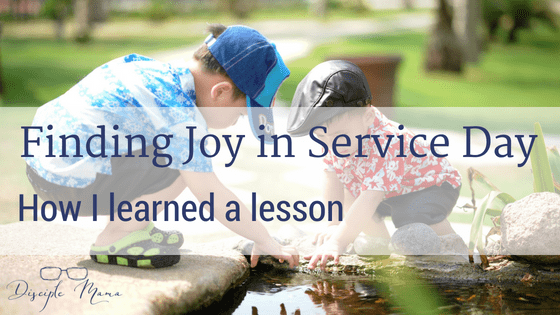 When we talked about serving others later this evening, I pointed out the ways he’d done it today and he got it, because I was speaking his language. It seems really obvious that I should have started with this new perspective, but it’s easy (for me at least) to get caught up in my own expectations and lose sight of how things look from a toddler’s egocentric point of view. Jesus, during His time here on earth, tried to lead everyone He met toward God. But he started with where they were, spiritually, rather than where he wanted them to be. In order to effectively disciple my son, I need to do the same. I’m thankful that I had that reminder today. And although Finding Joy in Service Day is officially over, caring for one another isn’t seasonal. 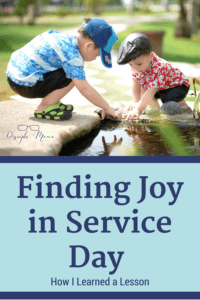 So, if you missed the opportunity to be intentional about emphasizing cheerful service to others today, it’ll be just fine if you start tomorrow instead. For more posts like this, sign up for the Disciple Mama Newsletter! Great reminder! I can’t count how many times I’ve gotten lost in my own expectations for my kids, forgetting to meet them where they are. I like how you were able to switch gears and remember all the good things he did that day. I need to do that! Thank you for this post. I wish I could say that I ALWAYS remember to do that, but I’m definitely still working on it. It’s easy to get discouraged by our unmet expectations, isn’t it? I’m so thankful for the patient parenting example the Heavenly Father sets for us!